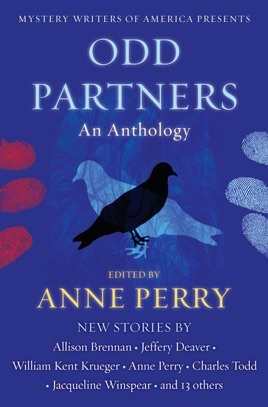 Unlikely pairs join forces to crack a slew of intriguing cases in an anthology edited by New York Times bestselling author Anne Perry, featuring original stories by Jacqueline Winspear, Jeffery Deaver, Allison Brennan, Charles Todd, and many more, including Perry herself. Throughout the annals of fiction, there have been many celebrated detective teams: Sherlock Holmes and John Watson. Nick and Nora Charles. Hercule Poirot and Arthur Hastings. Thomas and Charlotte Pitt. That last pair is the creation of beloved mystery writer Anne Perry, who, as the editor of Odd Partners and in conjunction with Mystery Writers of America, has enlisted some of today’s best mystery writers to craft all-new stories about unlikely duos who join forces—sometimes unwillingly—to solve beguiling whodunits. From Perry’s own entry, in which an English sergeant and his German counterpart set out to find a missing soldier during World War I, to a psychological tale of an airplane passenger who wakes up unsure of who he is and must enlist his fellow passengers to help him remember, to a historical mystery about a misguided witch-hunt and the unlikely couple that brings it down, each story deals in the wonderful complexities of human interactions. And not just human interactions: Honey bees avenge the death of their beekeeper, a wandering cat brings home clues to a murder, and a gray wolf and a fly fisherman in the Minnesota woods try to protect their land from a brash billionaire.